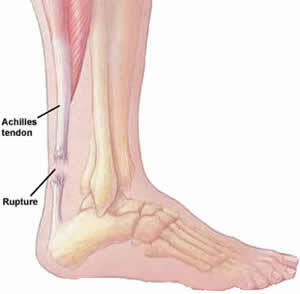 Achilles tendon rupture refers to the loss of continuity of the tendo Achillis, usually from attrition. The common differential diagnosis of Achilles tendon rupture are Incomplete (partial) tendo Achillis rupture. Partial rupture of gastrocnemius muscle, often medial head (previously thought to be “plantaris tendon rupture. There are few causes of achilles tendon rupture. Relative hypovascularity predisposing to tendon rupture in several tendons (Achilles, biceps, and supraspinatus). With advancing age, vascular supply to the tendon further compromised. Repetitive trauma leading to degeneration of this critical area and weakness. Rupture of tendo Achillis usually 2.5 to 5 cm from the insertion of the tendon into the os calcis. Most common causative event leading to rupture: sudden dorsiflexion of the plantar flexed foot (landing from a height) or sudden pushing off with the weight on the forefoot The tendon may be adversely affected by the use of fluoroquinolone antibiotics. Achilles tendon rupture may elicit collection of symptoms and signs. Injury often occurs during an activity that puts great stress on the tendon. Sudden “pop” is often felt followed by weakness and swelling. Sometimes the patient feels like he or she has been shot in the calf. Patient walks flat footed and is unable to stand on the ball of the foot. Tenderness and hemorrhage are present at the site of injury, and a sulcus is usually palpable but may be obscured by an organizing clot if the examination is delayed. Although active plantar flexion is usually lost, some plantar flexion occasionally remains because of the activity of the other posterior compartment muscle. Thompson’s test is usually positive. Test measures plantar flexion of the foot when the calf is squeezed with the patient kneeling on a chair; normal foot plantar flexes with calf compression, but movement is absent when tendo Achillis is ruptured. Excessive passive dorsiflexion of the foot isalso present on the injured side. Investigation need to be performed to elicit the present of achilles tendon rupture. MRI is beneficial in cases of partial rupture of achilles tendon. Achilles tendon rupture can be treated . Early referral is necessary for open, end-toe surgical repair. If surgery is contraindicated, a short leg cast applied with the foot in equinus may allow healing. In cases of neglected rupture, reconstruction is usually indicated. Physical therapy is helpful after repair to restore strength and flexibility. Bracing is required for partial rupture.